Around 30 science engagement practitioners who work with Inspiring Australia’s NSW Regional Science Hubs network gathered together at Bundanon for a Leadership Forum in November. 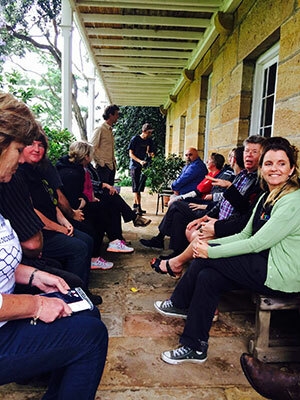 The three-day program included a mix of professional development and ideas exchange as well as an opportunity for participants to explore the power of art and science collaboration at the former home of celebrated artists Arthur Boyd and his wife Yvonne. Have you ever gazed at a winding, shimmering river and wondered about its beauty and form? Have you ever looked into the night sky and pondered the immenseness, the artistry of the stars and the silvery light of a distant moon? For eons, people have gazed at our world and wondered at the artistry of all things scientific. Our ability to see the wonder in our world and beyond grows ever better, yet how close do art and science live in today’s world? Such were the questions behind the 2015 NSW Regional Science Hubs Leadership Forum held from 11 to 13 November 2015. And what better venue that the incredible Bundanon Trust, where art and science have found a home that carries on the legacy of Australia’s art royalty, the Boyd family. Arthur Boyd was one of Australia’s foremost painters with a unique and distinctive style, capturing the beauty of the Australian landscape and its inhabitants. Often blending religious motifs, his works are now featured in major art galleries and in Parliament House. Arthur Boyd was born into a family of artists and creators, whose familial works are now on display in the 1866 family homestead at Bundanon and include an extensive range of portraits, landscapes, sculptures and ceramic works. Arthur and Yvonne Boyd granted Bundanon to the people of Australia, an 1100ha property that is now known as Bundanon Trust. In its strategy to engage the people of Australia in science at a local level, Inspiring Australia (NSW) has established a network of Regional Science Hubs – collaborative partnerships of local organisations that fly the flag for science through events and initiatives. Science Hubs support a diverse range of approaches to science engagement, from field tours and festival to Bioblitzes and science at the pub. In National Science Week alone there were more than 1700 events on offer across the country and there are many other science engagement events delivered in community settings all year round. Several coordinators spent a wonderful three days at Bundanon Trust, the lead organisation of the Shoalhaven Science Hub, an experience too rich to adequately put into words. Starting with a tour of the historic Bundanon homestead and its beautiful art collection, the group then joined Dr Tim Cohen from the University of Wollongong and his brother Dr Michael Cohen for a discussion of their Ten Trenches event. This initiative brought artistry to a scientific enquiry, with lights illuminating the night sky from the trenches and performances emerging from the earth. Trenches that had been dug to examine soil layers became the site of a public art event that explored the science in novel ways. The next day we were treated to a range of discussions to explore the experiences and insights of Hub members from across the state, particularly in how different groups have found success with their audiences. Dr Sarah Moss from ABC Open showcased the capabilities of this community platform for digital storytelling, imagery and videography. Check out our submissions! There were discussions on citizen science projects, how to embed activities that explore the rapidly emerging STEM (science, technology, engineering and maths) agenda, and strategies for building a loyal audience. In the evening Cowra artist Heather Valance treated us to a botanical drawing workshop deep in the forest at Bundanon. Using wood and bamboo nibs, we observed the form of leaves, trunks, water and sky and created some beautiful ink drawings. On the last day, Kate Dezarnaulds from TEDx Sydney shared insights developed over a long career in partnerships, marketing and philanthropy. This practical workshop helped us to think about the best strategies we could use to approach partners and raise income to support our community activities. With funding being a frequent sticking point for any public engagement strategy, Kate’s extensive experience and group facilitation skills helped us draw out the best options for engaging with funders and partners, from donors to sponsors and other sources of opportunity. The Forum was a fabulous experience for all of us and it is with immense gratitude and appreciation to Inspiring Australia NSW that this workshop was possible. Thanks to Inspiring Australia Manager Jackie Randles, Bundanon’s Education Manager Mary Preece and freelance producer Siobhan Moylan for helping us get there from across the state!